Hart’s son, Henry Hillman joined J.H. Hillman & Sons in 1946. 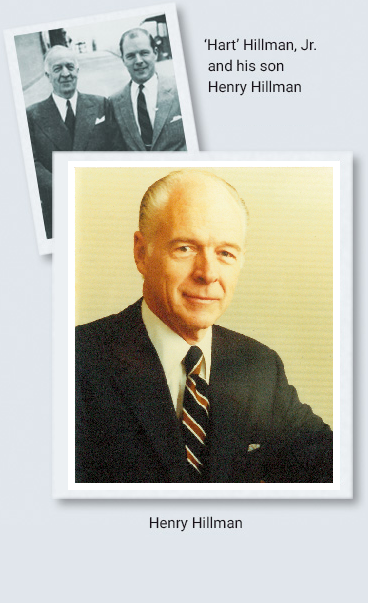 After his father’s death in 1959, Henry became president of the Hillman interests. He recognized that although the company’s industrial operations were successful, they were too modest to compete with much larger companies in what he accurately foresaw as a dramatically changing financial landscape. He immediately began to parlay these “sub-optimal” operating companies into opportunistic equity investments in an array of enterprises ranging from power shovels, rooftop air conditioners, a charter airline to deepwater oil drilling and pneumatics, prepared foods, sporting goods, generic pharmaceuticals, hospital supplies, copy machines, and hundreds more. Under his leadership, Hillman developed real estate from coast to coast, and became an early energy player in wind power as well as deep-well drilling for methane gas. The Hillman Company was a pioneer in the modern financial industry as that industry emerged as a force in the American economy. Taking a chance on innovators in new technology, Hillman in 1972 became a partner in the first venture capital fund of Kleiner Perkins, taking half of that fund. Again betting on people and innovative ideas, Hillman became a founding investor in the private equity buyout firm Kohlberg Kravis Roberts & Co., taking one third of the first fund in 1976. Through Kleiner Perkins and others, as well as directly, Hillman invested in such companies as Tandem Computers, Genentech, and Hybritech. By the early 1980s Hillman had become the largest single venture capital investor in the United States.